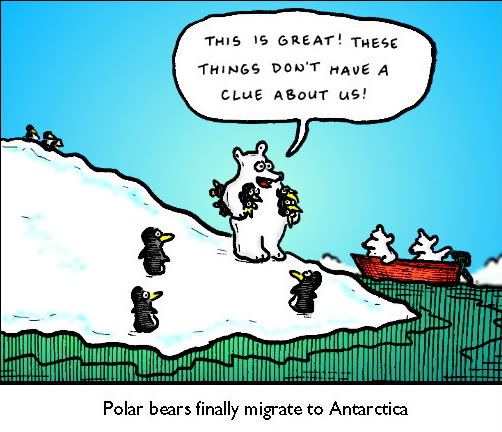 In searching for amusing material, I came to realize that polar bears and penguins have developed an amazing friendship — at least in cartoons and amusing videos. 2. Apparently, a male polar bear can develop a close cross-species relationship with a female penguin, but he’d better watch what he says. The second video on this page is from 4Mations, another UK website dedicated to interesting and funny cartoons. 3. Friendship. Did I mention friendship? Check out this shocking promo for King Pundit. 4. Who can forget the Coke commercial in which the polar bear family accidentally invades a Christmas party being held by a large group of penguins? 5. Here’s one called “Cold Friendship,” but I have to admit that its subtle message runs a little too deep for me to locate. 6. Animal Planet’s series called “Animals Save the Planet” includes a cartoon about the benefits of energy-saving light bulbs. I’m not sure if the penguin is a slave or just enjoys a lot of exercise. While I enjoy all this paring of polar bears and penguins, I have to wonder how they ever got together. Polar bears live in the Arctic on the top side of the world, while penguins live in the Antarctic on the bottom. Copyright David Farley. Used with permission of the artist. Cartoonist Dave Farley has his own vision about what would happen if these two species ever got together. See cartoon at right. Check out Dave’s complete archive of cartoons at the Dr. Fun website. Now on a more serious note, an online magazine called “Beyond Penguins and Polar Bears” has been written for elementary school teachers who wish to integrate science and literature. It’s a good place for anyone to learn about the polar regions of the Earth. According to the website’s creators, the first step toward understanding the two poles is to “develop a sense of place,” realizing that the Arctic and Antarctic are very different environments.